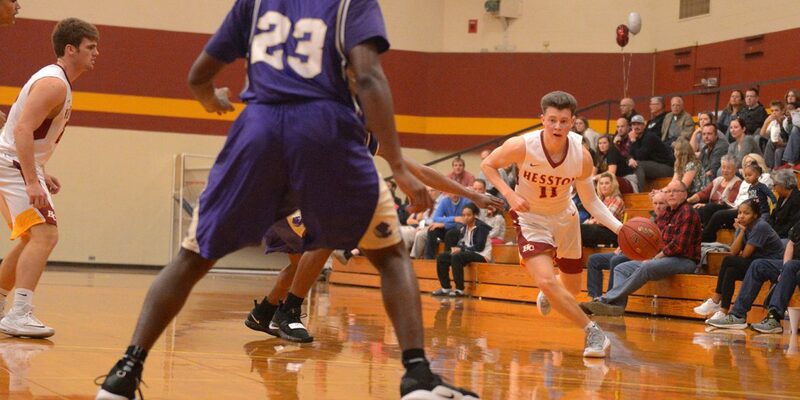 Hesston College joined the Kansas Jayhawk Community College Conference (KJCCC) this year and it has been a challenging start for the men’s basketball program. With the NJCAA #3 Highland Community College playing host last night to Larks, it was not about to get any easier. The Larks fell 83-66. The Larks took a quick lead on a Cal Hartley three-pointer on the opening possession, but battled uphill the rest of the game. The first half saw small runs for both teams and saw the Larks only trailing at different points by 2 or 3, staying in touching distance. The effort continued throughout the game but the Larks just could not close the gap. The second half started the same as the first, Hartley hit a three-pointer to draw the Larks within 5, but again, Hesston could not narrow the gap. Leading the Larks were Hartley with 21 points and Sterling Hicks with 18. Grant Harding added a double-double with 14 points and 10 boards. Off the bench Derrick Magiya added 4 points and 11 rebounds on the night. The Larks task does not get any easier. Saturday they travel to NJCAA #8 Johnson County for a KJCCC matchup. Tipoff will be at 4 p.m. The Larks are 10-12 on the season and 0-3 in the KJCCC.